Ownership of Amazon Alexa and Google Home devices has nearly tripled over the time between installments of the Infinite Dial. From 7% in 2017, ownership of just those two product lines reached 18% in 2018. That’s about 51 million smart speaker owners. 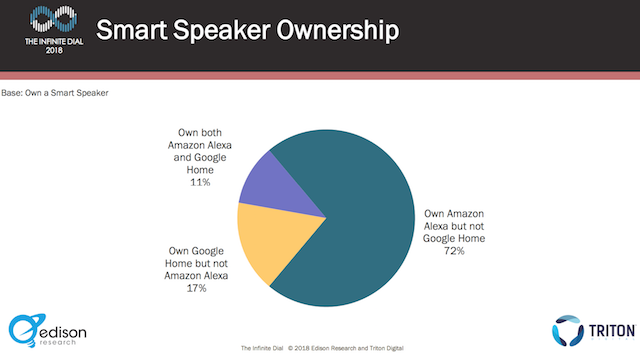 Among the participants who do own a smart speaker, 72% own an Amazon Alexa device, but nothing from Google Home. Google Home-only ownership took a 17% share. Impressively, 11% own devices from both brands. “Maybe there is room for three competitors,” Rosso mused, alluding to the recent launch of Apple HomePod. Many smart speakers are designed to be chained together, and 11% of the device owners said they have three or more. Twenty-two percent own two smart speakers, while two-thirds (67%) only possess one.